For the past couple of weeks, for the first time, people have been informing us that we’re ‘hipsters’. Which is funny for us, cause we were under the impression that hipster meant tight pants + flannel + neck scarves + art shows + indie music. We are way out of the loop here in Vancouver and have been since we arrived. But if to be hipster now means to dress like a Flamboyant Child, Laugh At Yourself and have the Most Fun Possible then we stand guilty as charged. If they’ve finally caught on to what we’ve been wearing and doing for the past 10 years and how much fun it is then Power To Them! 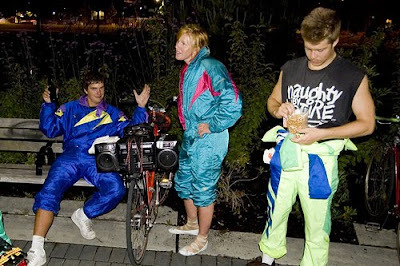 The more people full-time-rocking Neon, Spandex, Hypercolor, Belly Shirts, 1-Pieces, Fannypacks and Halloween Costumes the better in Nofuncouver! This entry was posted in Boombox Diaries, Miscellaneous. Bookmark the permalink.